Cells are the basic building blocks of life. Less poetically, they are the smallest units of living things that retain all of the basic properties associated with life itself (e.g., protein synthesis, fuel consumption and genetic material). As a result, despite their tiny size, cells have to perform a wide variety of functions, both coordinated and independent. This in turn means that they have to contain a wide range of distinct physical parts. Most prokaryotic organisms consist of only a single cell, whereas the bodies of eukaryotes such as yourself contain trillions. Eukaryotic cells contain specialized structures called organelles, which include a membrane similar to the one surrounding the whole cell. These organelles are the cell's ground troops, continually making sure that all of the cell's moment-to-moment needs are met. All cells contain, at an absolute minimum, a cell membrane, genetic material and cytoplasm, also called cytosol. This genetic material is deoxyribonucleic acid, or DNA. In prokaryotes, the DNA is clustered in one part of the cytoplasm, but it is not enclosed by a membrane because only eukaryotes have a nucleus. All cells have a cell membrane consisting of a phospholipid bilayer; prokaryotic cells have a cell wall directly outside the cell membrane for added stability and protection. The cells of plants, which along with fungi and animals are eukaryotes, also have cell walls. All cells also have ribosomes. In prokaryotes, these float freely in the cytoplasm; in eukaryotes they are typically bound to the endoplasmic reticulum. Ribosomes are often classified as a type of organelle, but in some schemes they do not qualify as such because they lack a membrane. Not labeling ribosomes organelles makes the "only eukaryotes have organelles" scheme consistent. 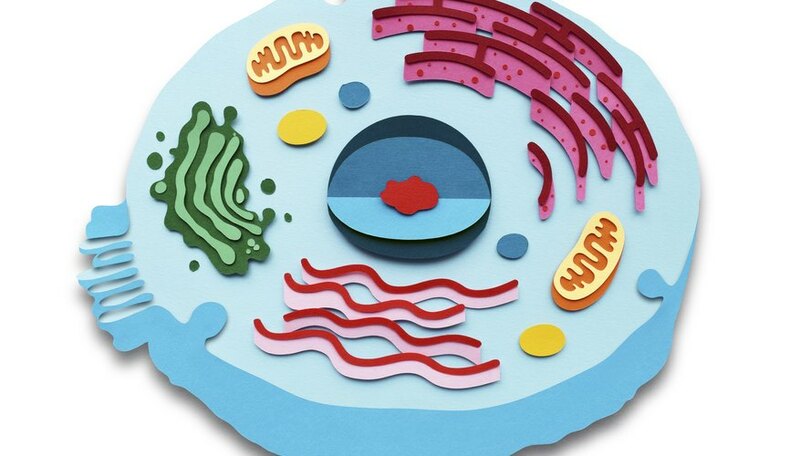 These eukaryotic organelles include, in addition to the endoplasmic reticulum, mitochondria (or in plants, chloroplasts), Golgi bodies, lysosomes, vacuoles and the cytoskeleton. The cell membrane, also called the plasma membrane, is a physical boundary between the cell's internal environment and the outside world. Do not, however, mistake this basic assessment for the suggestion that the cell membrane's role is merely protective, or that the membrane is merely some kind of arbitrary property line. This feature of all cells, prokaryotic as well as eukaryotic, is the product of a few billion years of evolution and is in fact a multifunctional, dynamic marvel that arguably functions more like an entity with genuine intelligence than a mere barrier. The cell membrane famously consists of a phospholipid bilayer, meaning that it is composed of two identical layers made up of phospholipid molecules (or more properly, phosphoglycerolipids). Each single layer is asymmetrical, consisting of individual molecules that bear something of a relationship to squids, or to balloons bearing a few tassels. The "heads" are the phosphate portions, which have a net electrochemical charge imbalance and are thus considered polar. Because water is also polar, and because molecules with similar electrochemical properties tend to aggregate together, this part of the phospholipid is considered hydrophilic. The "tails" are lipids, specifically a pair of fatty acids. In contrast to phosphates, these are uncharged and thus hydrophobic. The phosphate is attached to one side of a three-carbon glycerol residue in the middle of the molecule, and the two fatty acids are joined to the other side. Because the hydrophobic lipid tails spontaneously associate with each other in solution, the bilayer is set up so that the two phosphate layers face outward and toward the cell interior, whereas the two lipid layers commingle on the inside of the bilayer. This means that the double membranes are aligned as mirror images, like the two sides of your body. The membrane does not merely keep harmful substances from reaching the interior. It is selectively permeable, allowing vital substances in but barring others, like the bouncer at a trendy nightclub. It also selectively allows the ejection of waste products. Some proteins embedded in the membrane act as ion pumps to maintain equilibrium (chemical balance) within the cell. The cell cytoplasm, alternatively called the cytosol, represents the stew in which the various components of the cell "swim." All cells, prokaryotic and eukaryotic, have a cytoplasm, without which the cell could no more have structural integrity than an empty balloon could. If you have ever seen a gelatin dessert with pieces fruit embedded inside, you might think of the gelatin itself as the cytoplasm, the fruit as organelles and the dish holding the gelatin as a cell membrane or cell wall. The consistency of the cytoplasm is watery, and it is also referred to as a matrix. Regardless of the type of cell in question, the cytoplasm contains a far higher density of proteins and molecular "machinery" than does ocean water or any nonliving environment, which is a testament to the job the cell membrane does in maintaining homeostasis (another word for "equilibrium" as applied to living things) inside cells. In prokaryotes, the cell's genetic material, the DNA it uses to reproduce as well as direct the rest of the cell to make protein products for the living organism, is found in the cytoplasm. In eukaryotes, it is enclosed in a structure called the nucleus. The nucleus is delineated from the cytoplasm by a nuclear envelope, which is physically similar to the cell's plasma membrane. The nuclear envelope contains nuclear pores that allow for the influx and egress of certain molecules. This organelle is the largest in any cell, accounting for as much as 10 percent of a cell's volume, and is readily visible using any microscope powerful enough to reveal cells themselves. Scientists have known of the existence of the nucleus since the 1830s. Inside the nucleus is chromatin, the name for the form DNA takes when the cell is not preparing to divide: coiled, but not separated into chromosomes that appear distinct on microscopy. The nucleolus is the part of the nucleus containing recombinant DNA (rDNA), the DNA dedicated to the synthesis of ribosomal RNA (rRNA). Finally, the nucleoplasm is a watery substance inside the nuclear envelope that is analogous to the cytoplasm in the cell proper. In addition to storing genetic material, the nucleus determines when the cell will divide and reproduce. Mitochondria are found in animal eukaryotes and represent the "power plants" of cells, as these oblong organelles are where aerobic respiration takes place. Aerobic respiration generates 36 to 38 molecules of ATP, or adenosine triphosphate (the cells' main energy source) for every molecule of glucose (the body's ultimate fuel currency) it consumes; glycolysis, on the other hand, which does not require oxygen to proceed, generates only about one-tenth this much energy (4 ATP per glucose molecule). Bacteria can get by on glycolysis alone, but eukaryotes cannot. Aerobic respiration takes place in two steps, in two different locations within mitochondria. The first step is the Krebs cycle, a series of reactions that occur on the mitochondrial matrix, which is akin to the nucleoplasm or the cytoplasm elsewhere. In the Krebs cycle – also called the citric acid cycle or the tricarboxylic acid cycle – two molecules of pyruvate, a three-carbon molecule produced in glycolysis, enter the matrix for every one molecule of six-carbon glucose consumed. There, the pyruvate undergoes a cycle of reactions that generate material for further Krebs cycles and, more importantly, high-energy electron carriers for the next step in aerobic metabolism, the electron transport chain. These reactions take place on the mitochondrial membrane and are the means by which the ATP molecules are liberated during aerobic respiration. Animals, plants and fungi are the eukaryotes of note currently inhabiting Earth. While animals make use of glucose and oxygen to generate fuel, water and carbon dioxide, plants make use of water, carbon dioxide and the sun's energy to power the manufacture of oxygen and glucose. If this arrangement doesn't look like a coincidence, it is not; the process plants employ for their metabolic needs is called photosynthesis, and it is essentially aerobic respiration run exactly in the opposite direction. Because plant cells do not break down glucose by-products using oxygen, they do not have or need mitochondria. Instead, plants possess chloroplasts, which in effect convert light energy to chemical energy. Each plant cell has anywhere from 15 or 20 to about 100 chloroplasts, which, like mitochondria in animal cells, are believed to have once existed as free-standing bacteria in the days before eukaryotes evolved after apparently engulfing these smaller organisms and incorporating these bacteria's metabolic machinery into their own. If mitochondria are the power plants of cells, ribosomes are the factories. Ribosomes are not bound by membranes and are thus not technically organelles, but they are often grouped with true organelles for convenience. Ribosomes are found in the cytoplasm of prokaryotes and eukaryotes, but on the latter they are often attached to the endoplasmic reticulum. They consist of about 60 percent protein and about 40 percent rRNA. rRNA is a nucleic acid, like DNA, messenger RNA (mRNA) and transfer RNA (tRNA). Ribosomes exist for one simple reason: to manufacture proteins. They do this via the process of translation, which is the conversion of genetic instructions coded in rRNA via DNA to protein products. Ribosomes assemble proteins from the 20 types of amino acids in the body, each of which is shuttled to the ribosome by a particular type of tRNA. The order in which these amino acids are added is specified by the mRNA, each of which holds the information derived from a single DNA gene – that is, a length of DNA that serves as a blueprint for a single protein product, be it an enzyme, a hormone or an eye pigment. Translation is considered the third and final part of the so-called central dogma of small-scale biology: DNA makes mRNA, and mRNA makes, or at least carries instructions for, proteins. In the grand scheme, the ribosome is the only part of the cell that simultaneously relies on all three standard types of RNA (mRNA, rRNA and tRNA) in order to function. Most of the remaining organelles are vesicles, or biological "sacs," of some kind. The Golgi bodies, which have a characteristic "pancake-stack" arrangement on microscopic examination, contain newly synthesized proteins; the Golgi bodies release these in small vesicles by pinching these off, at which point these small bodies have their own closed membrane. Most of these small vesicles wind up in the endoplasmic reticulum, which is like a highway or railroad system for the entire cell. Some kinds of endoplasmic have many ribosomes attached to them, giving them a "rough" appearance under a microscope; accordingly, these organelles go by the name rough endoplasmic reticulum or RER. In contrast, ribosome-free endoplasmic reticulum is called smooth endoplasmic reticulum, or SER. Cells also contain lysosomes, vesicles that contain powerful enzymes that break down waste or unwanted visitors. These are like the cellular answer to a clean-up crew. 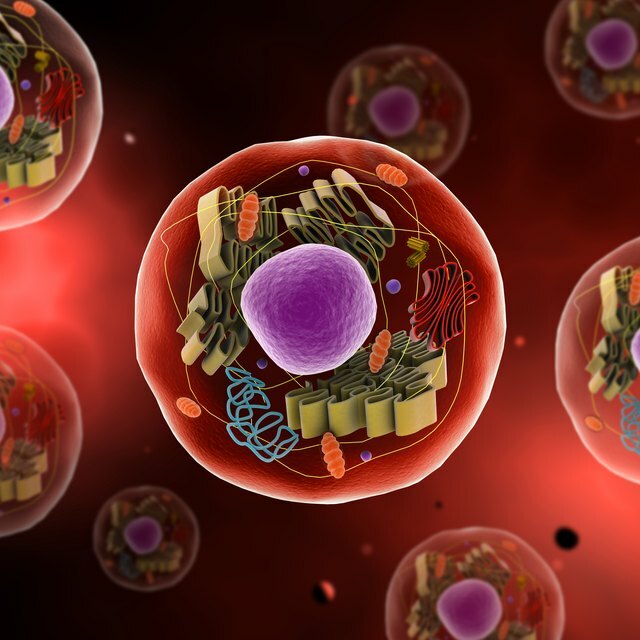 Scitable by Nature Education: What Is a Cell? Beck, Kevin. "What Do All the Parts of a Cell Do?" Sciencing, https://sciencing.com/do-parts-cell-do-8657384.html. 31 August 2018.